Search for specific location or meteor shower. While expected rates in your location may be high, several factors such as light, the moon, and cloud cover may interfere. Moon phase is ideal for gazing at the ETA Aqurids meteor shower. The peak of this shower coincides with a New Moon, so moonlight will not wash away ETA Aquarids meteors. Viewing locations are currently unavailable for this area; feel free to recommend a couple by clicking here. This year, the New Moon is slated to provide a moonless sky for those observing the Eta Aquarids meteor shower. Along with natural lighting from the moon, be aware that local conditions such as cloud cover, light pollution, and precipitation will also play a major role in the number of meteors you are likely to see. The radiant of the Eta Aquarids, also known as the point from which the meteors appear to come from, is situated in the "water jar" of the constellation Aquarius. For the best viewing experience, find an area unobstructed by structures and that is far away from city lights. Using binoculars or telescopes is not recommended, as your field of view will be greatly restricted, thus making the possibility of missing a "shooting star" more likely. Once you have settled down at your observation spot, face half-way up toward the eastern portion of the sky. Looking east, you will have the constellation of Aquarius, which is the radiant of the Eta Aquarids, within your field of view. To perhaps easily locate the radiant, you can locate a "Y" shaped pattern of stars known as a "peace sign" to several observers. If you see light pollution in the form of bright lights as you face east, you can face closer north or south. Looking directly up at the sky or into the radiant is not recommended since this is just the point in which they appear to come from. You are more likely to see a trail when looking slightly away from this point. Looking half-way up into the sky will lead to the best show in the house! Under a moonless sky and perfect viewing conditions, observers may be able to see 40 to 60 meteors per hour. 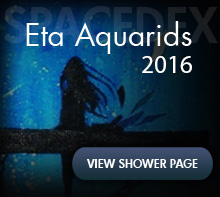 This year, the Eta Aquarids favors those living in the Southern Hemisphere. Those in the Northern Hemisphere will still see a great display, but more dramatic displays can be observed the further below the equator the equator, with the exception of Antarctica. 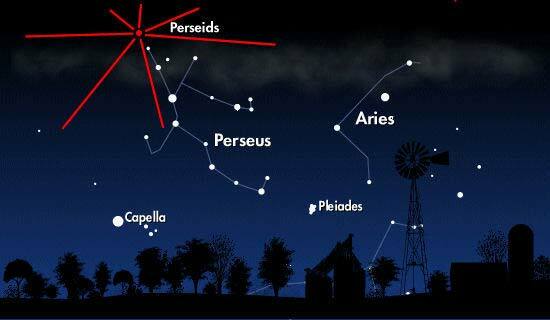 During ideal conditions, the Eta Aquarids meteor shower should put on a spectacular viewing experience! The clickable sky map below shows the night sky looking east around midnight on May 6th, 2016, the peak of the Eta Aquarids meteor shower. You are on the information page for this location. Know of a great destination with little or no light pollution in your area to view meteor showers? Is there a confirmed meet-up? Feel free to leave the address in the comments section below. Check out our Facebook page or 'Like' the site for updates about upcoming events happening in the skies of the world. Thanks for visiting and we hope you enjoy the show! The Zenithal Hourly Rate (ZHR) of a meteor shower is the number of meteors an observer would see in one hour under perfect conditions. This map shows the current position of the Sun and indicates which parts of Earth are in day and night. Try not to look directly up into the skies of the world. Instead, look half-way up into the sky for the best view! The Eta Aquarid meteor are the second fastest of any annual meteor shower. They travel at speeds of up to a blazing 148,000 mph (238,000 km/h). Only the Leonids of November hit our atmosphere faster. Keep in mind that any local light pollution or obstructions like tall trees or buildings will reduce your making a meteor sighting. Give your eyes time to dark-adapt before starting.